Human macrophages (Mφ) respond to Mycobacterium tuberculosis (Mtb) infection by undergoing apoptosis, a cornerstone of effective antimycobacterial host defense. Virulent mycobacteria override this reaction by inducing necrosis leading to uncontrolled Mtb replication. Accordingly, Mφ death induced by inoculation with Mtb had the characteristics of apoptosis and necrosis and correlated with moderate increase of mitochondrial permeability transition (MPT), mitochondrial cytochrome c release, and caspase-9 and -3 activation. We hypothesized that changes in intramitochondrial Ca2+ concentration ([Ca2+]m) determine whether Mφ undergo either apoptosis or necrosis. Therefore, we induced mechanism(s) leading to predominant apoptosis or necrosis by modulating [Ca2+]m and examined their physiological consequences. Adding calcium ionophore A23187 to Mφ inoculated with Mtb further increased calcium flux into the cells which is thought to lead to increased [Ca2+]m, blocked necrosis, stabilized MPT, decreased mitochondrial cytochrome c release, lowered caspase activation, and accompanied effective antimycobacterial activity. In contrast, Mφ infected with Mtb in presence of the mitochondrial calcium uniporter inhibitor ruthenium red showed increased mitochondrial swelling and cytochrome c release and decreased MPT and antimycobacterial activity. Thus, in Mtb-infected Mφ, high levels of mitochondrial membrane integrity, low levels of caspase activation, and diminished mitochondrial cytochrome c release are hallmarks of apoptosis and effective antimycobacterial activity. In contrast, breakdown of mitochondrial membrane integrity and increased caspase activation are characteristic of necrosis and uncontrolled Mtb replication. Estimates indicate that one-third of the world’s population is infected with Mycobacterium tuberculosis (Mtb)4, the causative agent of tuberculosis (1). Tuberculosis persists as a major cause for morbidity and mortality throughout the world due to issues of cost, compliance with drug treatment, drug resistance, and the AIDS epidemic. Thus, there is urgent need for enhanced knowledge of disease pathogenesis that might be the basis for novel approaches to treat and prevent this disease. Whereas the pathology of the disease is relatively well understood (2), little is known of the front line antimycobacterial defense mechanisms. In broad terms, we know that defense mechanisms of the innate immune system are of critical importance in the early suppression of the Mtb infection. It is known that macrophages (Mφ), the first line of defense against tuberculosis, undergo apoptosis when inoculated with Mtb and develop significant antimycobacterial activity (3, 4, 5). Mtb-induced Mφ apoptosis requires a dual signal, the action of TNF-α (6), and the activation of cytosolic phospholipase A2 (7), and is thought to result in activation of caspases, including caspase-9 and caspase-3. Caspase-9 is an initiator caspase of apoptosis and its activation, which leads to activation of the effector caspase caspase-3, requires formation of the “apoptosome”, a complex formed by cytochrome c released from the mitochondria into the cytoplasm, the cytosolic factor Apaf-1, ATP, and procaspase-9 (8, 9). Apoptosis is generally characterized by membrane blebbing, cellular condensation, and DNA fragmentation (10), and leads to removal of the sealed apoptotic bodies by phagocytosis predominantly through the phosphatidylserine receptor on the Mφ (11). In addition to apoptosis, there exists also an alternative cell death program, necrosis, which typically involves swelling of the cell and organelles, resulting in lysis of the plasma membrane, release of intracellular constituents, and induction of a strong inflammatory response (12). Necrosis often coexists with apoptosis and both types of cell death are observed simultaneously in many systems including tissue injury due to ischemia-reperfusion, toxic chemicals, and viral infections (13, 14). Although apoptosis of Mtb-infected Mφ is associated with diminution of the infection, preponderance of necrosis has been associated with increased bacterial growth (3, 4). There was some indication that the condition of the mitochondria is the branch point leading either to necrosis or to apoptosis. Therefore, we set up an experimental approach that favors either apoptosis or necrosis. Ca2+ is an intracellular messenger involved in cell death (15, 16). In HepG2 cells, increases in [Ca2+]m lead to mitochondrial permeability transition (MPT) and to apoptosis (17). Therefore, we performed experiments which either favored apoptosis or necrosis by manipulation of the [Ca2+]m.
Ca2+ ionophore A23187, cyclosporin A, ruthenium red (RR), propidium iodide (PI), and cycloheximide (CHX) were from Sigma-Aldrich (St. Louis, MO), and streptolysin O was from Cogenix (Peterborough, U.K.). 3,3′-dihexyloxycarbocyanine iodide (DiOC6(3)), pluronic-F27, and Fluo-3 were from Molecular Probes (Eugene, OR). Murine monoclonal anti-caspase-3 Abs were purchased from Transduction Laboratories (Lexington, KY), and goat anti-caspase-9 Ab from Oncogene Research Products (San Diego, CA). Ab against cytochrome c were a kind gift of Dr. R. Jermmerson (University of Minnesota Medical School, Minneapolis, MN). Mouse anti-human poly(ADP-ribose) polymerase (PARP) was from Santa Cruz Biotechnology (Santa Cruz, CA). The attenuated Mtb strain H37Ra (American Type Culture Collection, Manassas, VA) was grown in 7H9 broth (Difco, Detroit, MI) with 10% BSA-glucose-catalase supplement (BD Biosciences, Mountain View, CA) and 0.05% Tween 80 (Difco) and resuspended in 7H9 broth at 5 × 107 CFU/ml. Mononuclear cells from peripheral blood of healthy donors after obtained informed consent were isolated as previously described (7). Mφ for the in situ TUNEL assay were cultured on plastic cover slips (Nunc, Rochester, NY) and were plated at 2.5 × 106 mononuclear cells/ml/well in 24-well cluster plates (Costar, Cambridge, MA). Mφ used for Western blot analysis were cultured on Costar 100-mm diameter tissue culture dishes (Costar) at 2 × 107 mononuclear cells/10 ml/dish. The resulting Mφ population (2.5 × 105 cells/coverslip or 2.0 × 106 cell/dish) were 97–99% pure as determined by nonspecific esterase staining. The Mφ were cultured in IMDM with 10% pooled human serum for 7 days to allow for Mφ differentiation before Mtb infection. Mφ were infected with five bacteria per cell. Counting of mycobacteria using the Bactec model 460TB system (BD Biosciences) was performed as described (7). Apoptosis of adherent Mφ was measured using a fluorescent in situ TUNEL assay (In Situ Cell Death Detection kit, tetramethylrhodamine-dUTP, catalog no. 2156792; Roche Biosciences, Indianapolis, IN) according to the specifications of the manufacturer. Mφ necrosis was determined by PI staining of nuclei (18). In brief, following the experimental procedures, glass-adherent Mφ were incubated with 10 μM PI at room temperature for 10 min. The cells were then washed two times with PBS, the coverslip dried, and PI-positive cells evaluated by fluorescence microscopy. Of note, PI stains at the early time points tested in these experiments only nuclei of cells whose membranes are permeable to this dye which is a sign for necrosis. The cell membranes of apoptotic Mφ are impermeable to PI, unless the Mφ undergo secondary necrosis. The assays were performed not later than 72 h after initiation of the cell culture, because at later time points cell membranes of apoptotic Mφ become permeable to PI, which indicates the onset of secondary necrosis. In cultures harvested at and before 72 h, <10% of the total adherent cells present at time 0 are dislodged, which guarantees that only a minimum of total cells had been lost. Mφ cultured in 24-well culture plates were washed twice with cold PBS and 1 ml of 1 μg/ml streptolysin O in PBS was added to permeabilize the cells and the plates were incubated at 4°C for 5 min. The streptolysin O solution was replaced with 1 ml of transport buffer (78 mM KCl, 4 mM Ca Cl2, 50 mM HEPES buffer (pH 7.2), 2 mM DTT, and 1 μg/ml of protease inhibitors). After incubation at 37°C for 5 min and on ice for 20 min the cells were dislodged with a rubber policeman and pelleted at 500 × g. Supernatants were analyzed by Western blotting for cytochrome c released from the mitochondria. The cells were washed twice with PBS, dissolved in 1 ml of lysis buffer containing 250 mM NaCl, 50 mM HEPES buffer (pH 7.0), 0.1% Nonidet P-40, 50 mM NaF, 5 mM EDTA, 1 mM DTT, 0.3 mM PMSF, incubated on ice for 10 min and centrifuged at 10,000 × g for 10 min. Protein concentrations were measured using the Bradford assay. Fifty micrograms of cell extract were processed to determine cytochrome c remaining in the mitochondria. Mφ were preincubated for 15 min and for the remaining time of the experiment with CHX (10 μg/ml) which blocks de novo protein synthesis to increase the sensitivity of the assay. Following the experimental procedures, Mφ were treated at 4°C with lysis buffer for 1 h at 4 × 106 cells/ml and centrifuged at 15,000 × g for 10 min. Fifty micrograms of cell lysates were heated in 2× sample buffer at 95°C for 5 min and resolved in 7.5 or 12% SDS-polyacrylamide gels, transferred to polyvinylidene difluoride membranes (Immobilon-P; Millipore, Bedford, MA), and blocked with 10 mM Tris buffer (pH 7.5) containing 150 mM NaCl, 0.05% Tween 20, and 5% dry milk for 2 h. The membranes were incubated with Ab (1 μg/ml) against caspase-3, caspase-9, cytochrome c, or PARP. Isotype-matched irrelevant Abs were used as controls. Membranes were then washed and blotted with HRP-protein A (Zymed Laboratories, San Francisco, CA). After extensive washing with 10 mM Tris-HCl buffer (pH 8.0) containing 150 mM NaCl and 1% Tween 20, the membranes were developed in CL reagent (NEN, Boston, MA) and exposed to x-ray film. MPT induction was assessed in Mφ to evaluate mitochondrial membrane potential (ΔΨm) by measuring the retention of the lipophilic cationic dye DiOC6(3) within mitochondria as a consequence of the ΔΨm (20). MPT results in the loss of ΔΨm which causes decreased retention of DiOC6(3) in the mitochondria. Following the experimental procedures, CHX pretreated Mφ cultured in 6-well plates were washed twice with PBS. The cells were then incubated for 30 min with 1 nM DiOC6(3) at 37°C. Digitonin was then added to a final concentration of 7.5 μM for 20 min, the cells were washed three times with PBS, fixed with 1% formaldehyde for 20 min, and washed twice with PBS. Thereafter, the cells were dislodged from the plates using a rubber policeman and analyzed for fluorochrome incorporation in a BD FACSort flow cytometer (BD Biosciences). The Mφ population with reduced DiOC6(3) was determined by setting the gate to allow separation of the cell population with reduced staining from the Mφ population with intact mitochondria showing high staining with DiOC67(3). Percentage of Mφ with reduced DiOC6(3) staining of the total gated cell population was determined. Mφ were cultured in IMEM containing 10% human serum in 10-cm plastic petri dishes. Following the experimental procedures, the cells were washed three times in 0.1 M sodium cacodylate (pH 7.3) and fixed with 5 ml of MJK/2 solution for 2 h, removed by using a rubber policeman, transferred to microcentrifuge tubes, and stored overnight at 4°C. The cells were then exposed to 1% uranyl acetate in water for 15 min at room temperature, washed twice with distilled water, centrifuged into 3% agarose at 45°C, and cooled to form blocks. The agarose blocks were dehydrated using graded steps of acetone and embedded in Spurr’s low viscosity media. After polymerization at 65°C overnight, 80-nm sections were cut and picked up with copper grids which were then stained with uranyl acetate and bismuth subnitrate. The sections were analyzed with a Jeol electron microscope (Jeol USA, Peabody, MA) and recorded on Kodak sheet film (Eastman Kodak, Rochester, NY). Mφ were plated on glass coverslips in 24-well plates, 1.0 × 105 cells/well, in calcium-free IMEM without phenol red containing 10% pooled human serum. After the cells were inoculated with Mtb in absence or presence of A23187 from 15 min to 2 h, the cells were loaded with 0.5 ml fluo-3/AM solution (10 ml HEPES buffer (pH 7.2) containing 60 μg Fluo-3/AM, 10 μl Pluronic F-127, and 40 μl of 1 M probenecid). The cells were then incubated for 30 min at room temperature and washed three times with PBS. Following experimental procedures, the cells were washed and the coverslips containing the Mφ transferred into Mackaness-type chambers. The chambers were filled with IMEM containing 10% human serum. Accidental infection with Mtb was prevented by containment of the bacteria within the Mackaness-type chambers. Ca2+ flux was assessed by mounting the Mackaness-type chamber on a Biophysica microscope chamber which had been modified for use with an ACAS 570 Ultima Interactive Laser Cytometer (Meridian Instruments, Okemos, MI; Ref. 21). Changes in [Ca2+]i were assessed by fluorescence analysis of Mφ at an excitation wavelength of 488 nm and an emission wavelength of >515 nm, quantified as relative fluorescence intensity and displayed on a pseudocolor intensity scale. Results are expressed as mean ± SEM. The data were analyzed using SigmaStat Statistical Software (Jandel, San Rafael, CA) using a t test for normally distributed data with equal variances and the Mann-Whitney U rank sum test for data populations with nonnormal distributions and/or unequal variances. Mφ cultures incubated with Mtb for 0, 24, 48, and 72 h were assayed for apoptotic and necrotic cells. Apoptic adherent Mφ were determined by fluorescent microscopy using a TUNEL assay and necrotic Mφ by PI staining of the nuclei (see Materials and Methods). At all indicated time points, <5% of the cultured Mφ became detached and were lost. At 48 and 72 h, ∼50% of Mφ were apoptotic and 15–50% of the Mφ were necrotic (Fig. 1⇓), demonstrating that inoculation with Mtb induces cell death with the characteristics of both apoptosis and necrosis (14, 15). Inoculation of Mφ with Mtb resulted also in moderate loss of ΔΨm as manifested by decreased mitochondrial accumulation of DiOC6(3), by release of cytochrome c from the mitochondria, and activation of the caspases-9 and -3. (see Figs. 5⇓, 6⇓, and 8⇓). Time course of apoptosis and of necrosis of Mφ infected with Mtb (5 organisms/cell). Infected and uninfected Mφ were tested for apoptosis (⋄, ♦) and for necrosis (○, •) at the indicated time points. The difference in percentage of apoptosis between Mφ inoculated with Mtb and uninfected Mφ is statistically significant at 48 h (p = 0.0027, n = 3) and 72 h (p = 0.015, n = 3). The difference in percentage of necrosis between infected and uninfected Mφ cultures among the treatments at 48 h (p = 0.06, n = 3 and Mtb vs Mtb + RR, p = 0.03, n = 3) and at 72 h (p = 0.004, n = 3) is statistically significant. We next investigated whether inoculation of Mφ with Mtb has an effect on calcium flux. Inoculation with Mtb moderately increased calcium flux into the Mφ which was detectable at 2 h (data not shown) and maximal at 4 h (Fig. 2⇓, upper right panel). Addition of A23187 further increased calcium levels (Fig. 2⇓, lower left panel) and the L-type Ca2+ channel blocker dilthiazem completely inhibited Mtb-induced calcium flux (Fig. 2⇓, lower right panel). Ca2+ flux in Mφ untreated (upper left panel), infected with Mtb (5 organisms/cell) (upper left panel), infected with Mtb and treated with 0.5 μM A23187 (lower left panel), and Mφ infected and treated with 2 μM dilthiazem (lower right panel). Ca2+ flux was determined 4 h after infection. Relative [Ca2+]i in single cells is indicated on a pseudocolor scale of fluorescence intensity by the colors indicated on the right. 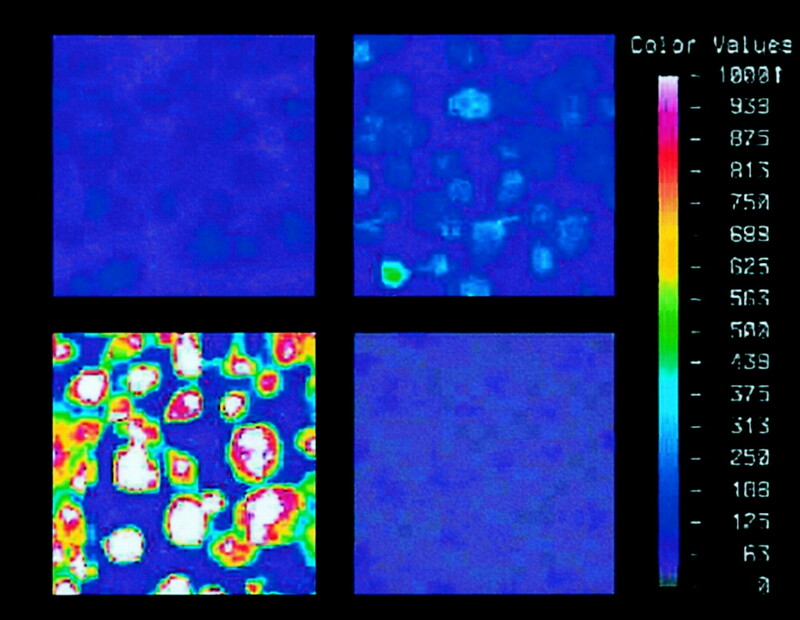 The picture images are taken from a typical experiment of three experiments. To investigate whether increase of [Ca2+]i blocks necrosis, Mφ were infected in the presence of 0.5 μM A23187. With A23187, the percentage of apoptotic Mφ at 48 h was similar to that without A23187 (44 ± 1% vs 46 ± 2% in Mφ infected without A2318, n = 3), while a significant decrease of necrotic cells was seen in comparison to Mφ cultures infected without A23187 (Fig. 3⇓). Lower concentrations of A23187 had no effect (data not shown). Less than 5% necrotic Mφ were seen in noninfected cultures with or without A23187 (data not shown). Although it is well recognized that [Ca2+]i overload caused by ionophore leads to cell death (22, 23), the increase of [Ca2+]i induced by A23187 alone did not induce Mφ mortality (data not shown). Time course of necrosis of Mφ infected with Mtb in presence of A23187 or RR. Mφ remained uninfected (○) or were infected in absence (•), in presence of 0.5 μ M A23187 (▴), or in presence of 5 μg/ml RR (▪). The differences in percentage of necrosis among the treatments at 48 h (Mtb vs Mtb + A23187, p = 0.06, n = 3, and Mtb vs Mtb + RR, p = 0.03, n = 3) and at 72 h (Mtb vs Mtb + A23187, p = 0.004, n = 3, and Mtb vs Mtb + RR, p = 0.006, n = 3) are statistically significant. To determine whether block of necrosis correlates with inhibition of mycobacterial growth, we induced predominantly apoptosis by infecting Mφ in presence of A23187 and measured the number of bacteria in the cultures. Mtb replication in Mφ cultures infected with Mtb was significantly restricted after 48 h in presence of increased concentrations of A23187 (Fig. 4⇓, right panel; Ref. 24) in comparison to Mtb growth in Mφ cultured without additives paralleling the marked abrogation of Mφ necrosis in presence of A23187 (Fig. 4⇓, left panel). Effect of increasing concentrations of A23187 on necrosis of Mφ infected with Mtb (left panel) and on mycobacterial growth (right panel) in Mφ cultures. Mφ were infected with 5 Mtb/Mφ for 48 h in the presence of the indicated concentrations of A23187. 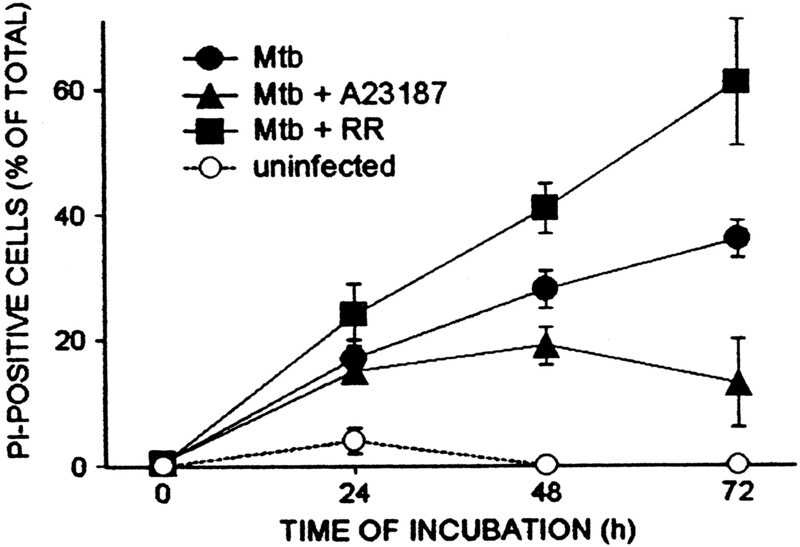 Note that Mtb growth in Mφ cultures was significantly restricted after 48 h with 0.13–0.75 μM A23187 (Fig. 3⇑, right panel) compared with cultures without additives (p = 0.04, n = 4), paralleling the marked abrogation of Mφ necrosis (Fig. 3⇑, left panel, p = 0.005, n = 3). Release of cytochrome c from the mitochondria is a critical requirement for induction of programmed cell death (8, 9). Therefore, we determined whether release of cytochrome c from mitochondria is altered by A23187. In Mφ infected with Mtb, ∼40% of total cytochrome c was released from the mitochondria (Fig. 5⇓, first lane from right), indicating that Mtb infection increases permeability of the inner mitochondrial membrane to cytochrome c. Increasing [Ca2+]i diminished mitochondrial release of cytochrome c significantly (Fig. 5⇓, fourth lane from left). 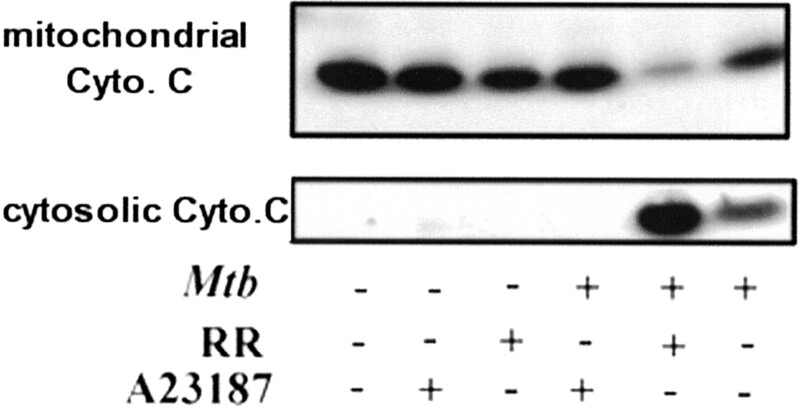 Mitochondrial cytochrome c release of Mφ infected with Mtb is inhibited by A23187 and enhanced by RR. Mφ were infected for 48 h with 5 Mtb/cell in absence and presence of 5 μg/ml RR or 0.5 μM A23187. Cytochrome c present in the mitochondria and in the cytosol was determined by Western blotting. Anti-actin Ab was used as a loading control (data not shown). To determine whether activation of caspase-3 and caspase-9 correlates with necrosis or apoptosis, we assessed the activation of caspase-3 and caspase-9 in Mtb-infected Mφ in presence of A23187 by determining the amount of residual procaspase. In these experiments, Mφ were preincubated with CHX to prevent synthesis of procaspases during culture. In CHX-pretreated Mφ, both Mtb and TNF-α needed to be added to induce activation of caspase-3 and caspase-9 and degradation of PARP, an important caspase-3 substrate (Ref. 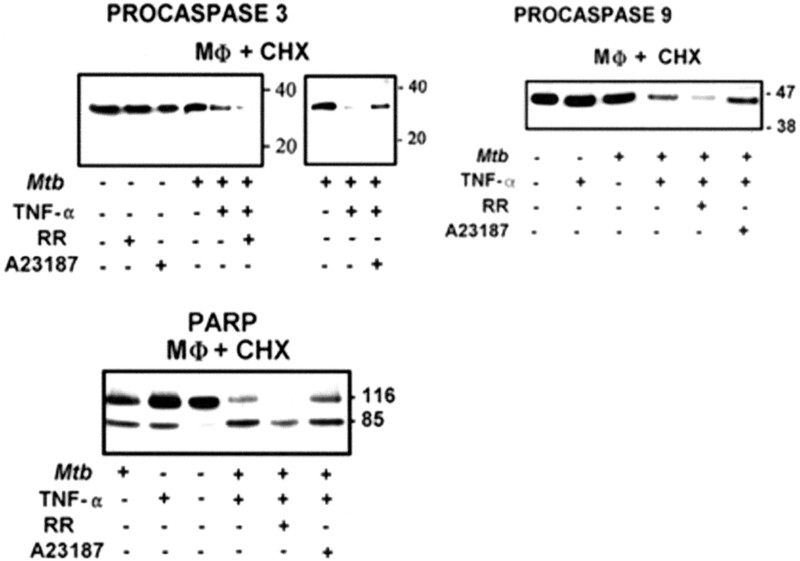 25 ; 70 and 60% loss of procaspase-3 and procaspase-9 and 45% PARP degradation, respectively, Fig. 6⇓). 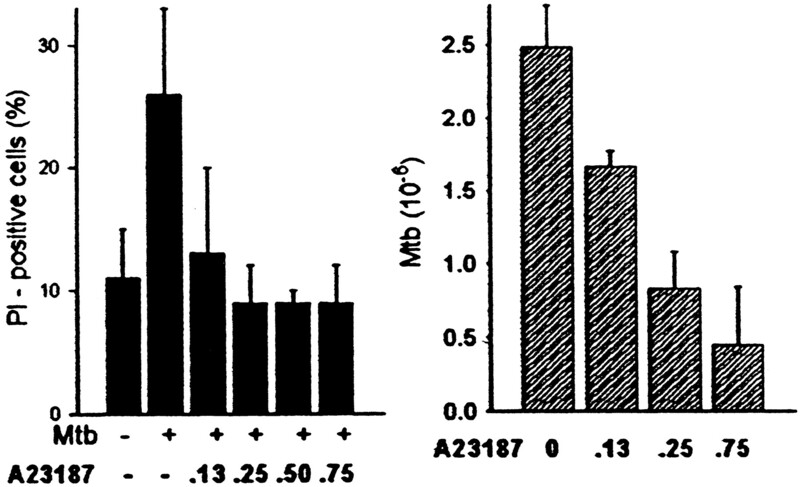 A23187 decreased procaspase-3 activation and procaspase-9 activation (29 and 15% loss of procaspase-9 and procaspase-3, respectively), although the percentage of apoptotic Mφ in the cultures was increased (Fig. 1⇑). The inhibitory effect of A23187 on degradation of PARP was minimal. Caspase-3 and caspase-9 activation and PARP degradation in Mtb-infected Mφ is inhibited by A23187 and up-regulated by RR. CHX-treated Mφ were infected or not infected with Mtb in presence or absence of A23187 (0.5 μM) or RR (5 μg/ml). After 24 h, the cells were harvested and examined by Western blotting for procaspase-3 (32 kDa) and procaspase-9 (47 kDa) degradation and PARP (116 kDa) degradation into the main proteolytic product of PARP (85 kDa). Anti-actin Ab was used in parallel as a loading control (data not shown). RR, an inhibitor of the mitochondrial Ca2+ uniporter, blocks Ca2+ flux through mitochondrial membranes and decreases [Ca2+]m (26, 27, 28). In presence of 5 ng/ml RR, a marked increase in percentage of necrotic Mφ after inoculation with Mtb was seen at 48 and 72 h compared with Mφ cultures infected without RR (Fig. 3⇑). In contrast, the percentage of apoptotic Mφ was not different from that in Mφ cultures infected without RR (47 ± 9% vs 46 ± 2, n = 3). Uninfected Mφ cultures incubated with A23187 (data not shown), or with RR alone (data not shown) did not show an increase of necrosis over background levels. Mφ necrosis augmented by RR (Fig. 7⇓, left panel) correlated with an increase of mycobacterial replication (Fig. 7⇓, right panel). Effect of RR in Mtb-infected Mφ cultures on necrosis (left panel) and on mycobacterial replication (right panel). Mφ were infected for 48 h without or with RR. Necrosis (left panel, p = 0.02, n = 4) and mycobacterial replication (right panel, p = 0.05, n = 3) were significantly increased. In contrast, addition of A23187 significantly blocked mycobacterial replication. We confirmed these findings using the L-type Ca2+ channel inhibitor dilthiazem known to decrease [Ca2+]i (29) leading to decreased [Ca2+]m. Addition of 2 μM dilthiazem to infected Mφ increased the amount of necrotic Mφ after 3 days from 37 ± 1 to 53 ± 2% (p = 0.0001, n = 3). No increase of necrosis was observed in the presence of dilthiazem alone (data not shown). These results indicate that decrease of [Ca2+]i induces predominantly necrosis after infection with Mtb, but does not induce Mφ death in absence of infection. In presence of RR, Mtb inoculation dramatically enhanced cytochrome c release from the mitochondria resulting in 75% release of total cytochrome c (Fig. 5⇑, second lane from right). Addition of RR to uninfected Mφ had no effect (Fig. 5⇑, third lane from left). Furthermore, RR strongly enhanced caspase-9 activation, caspase-3 activation, and PARP degradation in CHX-pretreated Mφ infected for 12 h with Mtb in presence of TNF-α (90, 80, and 94% decrease of procaspase-9, procaspase-3, and PARP, respectively, compared with Mφ infected without RR; Fig. 6⇑). RR alone had no effect on caspase activation and PARP degradation (Fig. 6⇑, upper left panel, data not shown for caspase-9 and PARP). It should be noted that necrosis of RR-treated cells is not caused by increased activation of PARP leading to ATP depletion (30), because addition of RR also markedly enhanced degradation of PARP (Fig. 6⇑). We further investigated whether MPT is required for induction of necrosis or apoptosis. MPT causes irreversible breakdown of the mitochondrial transmembrane potential ΔΨm (31) which correlates with the release of cytochrome c from mitochondria. To assess MPT, accumulation of the fluorescent cationic dye DiOC6(3) (20) in the mitochondrial matrix was determined as a consequence of the ΔΨm. Release of DiOC6(3) from the mitochondria is considered a reliable indicator for ΔΨm loss and of MPT pore opening (20). Optimal results were obtained when we measured the retention of DiOC6(3) within mitochondria in Mφ pretreated with CHX at day 3. A significant decrease of dye retention in the mitochondria was seen in Mφ infected with Mtb alone as compared with noninfected controls which was enhanced by addition of TNF-α. A substantial loss of dye retention was measured in infected cultures incubated with TNF-α and RR, indicating significant MPT (Fig. 8⇓, lane 1 from the right). 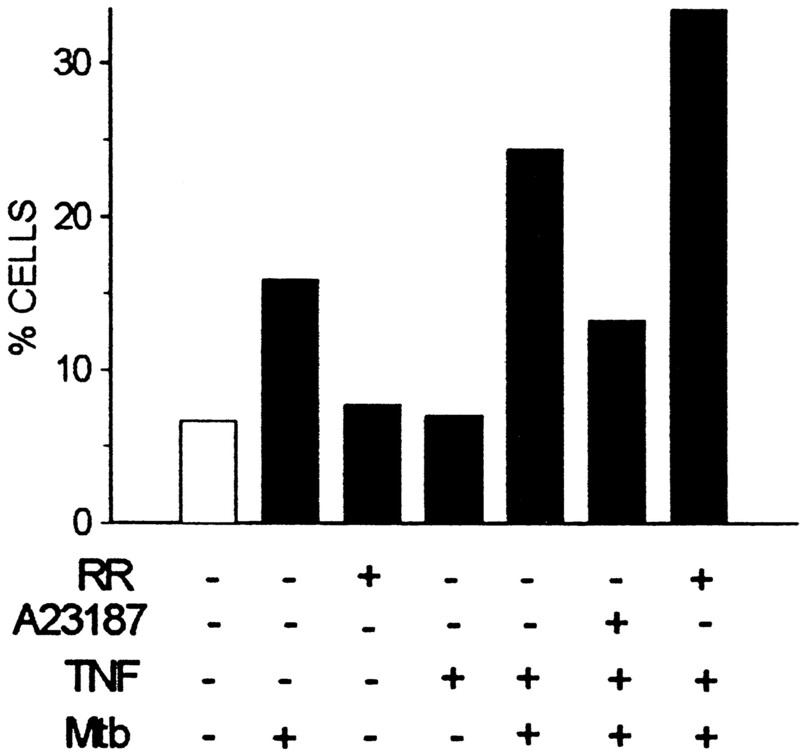 Mφ incubated with Mtb, TNF-α, and A23187 alone showed dye retention similar to cell cultures infected with Mtb in absence of TNF-α (Fig. 8⇓, lane 4 from right). These experiments clearly demonstrate that massive mitochondrial damage is caused by Mtb in presence of RR that leads to loss of DiOC6(3) retention as the consequence of MPT and irreversible ΔΨm loss. A23187 prevents mitochondrial damage and loss of dye retention. 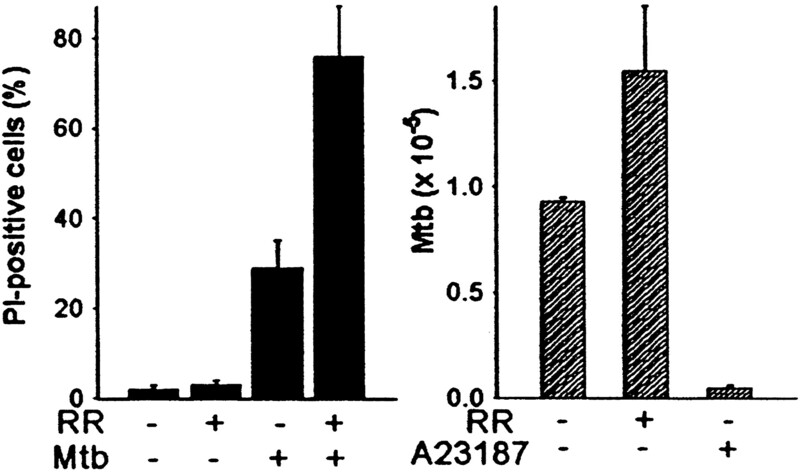 MPT in Mφ infected with Mtb is increased by RR and blocked by A23187. CHX and DiOC6(3)-preincubated Mφ were infected for 48 h with 5 Mtb/cell without and with TNF-α, 5 μg/ml RR, and of 0.5 μ M A23187. The cell population with reduced dye retention was gated. Cationic dye retention in mitochondria of Mφ infected with Mtb in presence of RR was statistically significantly lower than dye retention in mitochondria of Mφ incubated with Mtb and TNF-α and with Mtb, TNF-α, and A21387 (p = 0.001, n = 3). Similar results were obtained in electron microscopic studies that assessed mitochondrial swelling. Mφ incubated with Mtb and RR for 4 days show significant mitochondrial swelling indicating mitochondrial membrane damage, whereas uninfected Mφ and Mφ treated with RR alone contained normally sized mitochondria (Fig. 9⇓). Mtb induces mitochondrial swelling of Mφ incubated with RR. 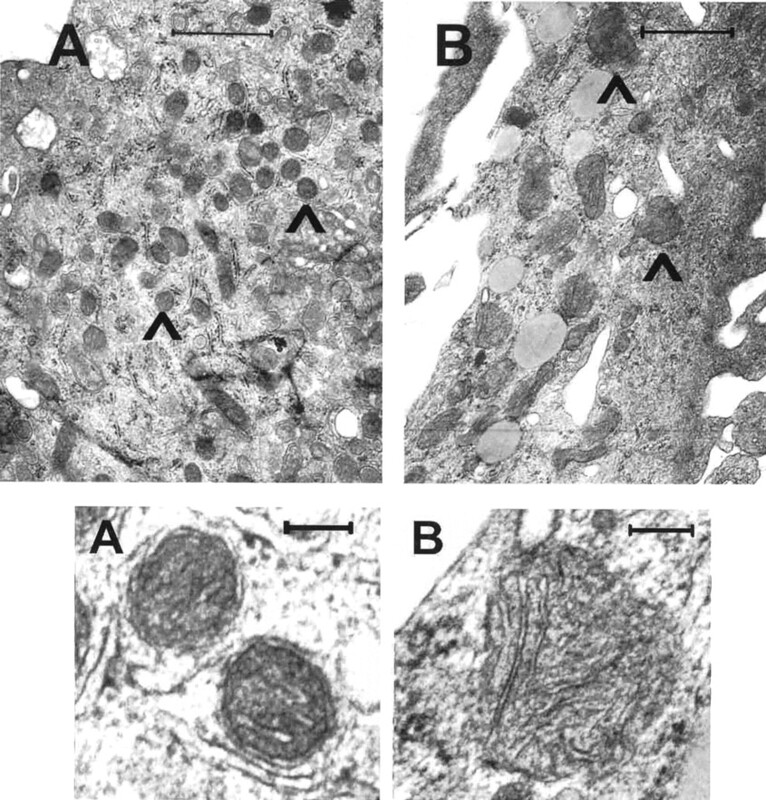 RR-treated Mφ remained uninfected (A) or were infected with Mtb (B) for 24 h and examined by transmission electron microscopy for mitochondrial swelling. Upper panels, Low power electron micrographs of Mφ (the bar represents 1 μm); lower panels, higher power electron micrographs of single mitochondria (the bar represents 0.1 μm). Note that Mφ incubated with RR and Mtb show swelling of the mitochondria and loss of the outer mitochondrial membrane (B, lower panel). Mitochondria of Mφ incubated without additive or infected with Mtb in absence of RR showed identical appearance to those in A (data not shown). Mφ inoculated with Mtb undergo apoptosis, which is associated with strong antimycobacterial activity. Experiments with virulent mycobacteria suggested that these pathogens are able to override the detrimental effects of apoptosis by inducing necrosis, which results in uncontrolled mycobacterial growth (4, 5). We hypothesized that the branch point for either apoptosis or necrosis is the mitochondrial membrane permeability and that the mitochondrial membrane permeability depends on [Ca2+]i.
Ca2+ is known to be a universal secondary messenger indispensable in the majority of cellular signal transduction pathways including fertilization, proliferation, and development. Ca2+ signaling is important for membrane excitability, mitochondrial metabolism, vesicle secretion, mitosis, muscle contraction, NO production, and in the induction of cell death (32). Previously, increase of [Ca2+]i in Mφ was found to maintain mitochondrial integrity (17, 33) and to cause apoptosis (15, 16, 17). The present study demonstrates that increase of intracellular Ca2+ protects mitochondria from irreversible damage by Mtb, promotes apoptosis, and inhibits Mφ necrosis and mycobacterial survival. However, intracellular Ca2+ concentrations seem to have a broad effect on multiple antimycobacterial mechanisms including defense mechanisms that are not dependent on mitochondrial function. Block of calcium influx was found to have a direct inhibitory effect on phagosome-lysosome fusion (24, 34). Down-regulation of calcium influx resulting in block of Mφ maturation clearly correlates with a significantly decreased defense capacity against mycobacteria in Mφ which do not undergo programmed cell death (24). The importance of this finding is underscored by the observation that virulent Mtb are able to inhibit Ca2+ signaling and Mφ phagosome-lysosome fusion which results in increased intracellular survival of the Mtb (24). Therefore, the action of intracellular calcium resulting in antimycobacterial defense is not always dependent on the status of the Mφ with respect to programmed cell death. It was suggested that moderate increase of [Ca2+]i up-regulates the cell’s energy state and thereby protects mitochondrial integrity (33, 35). Consequently, ATP depletion (36) was found to lead to irreversible loss of ΔΨm and to necrosis (37). In contrast, selective reconstitution of the extramitochondrial ATP pool with glucose prevented necrosis in ATP-depleted cells and restored the ability of the cells to undergo apoptosis (38). In Mφ, ATP is also necessary for increased antimycobacterial activity (39). Our studies further indicate that increased caspase activation leads to Mφ necrosis, but the possibility that increased caspase activation under necrotic conditions is the result of a general breakdown of cellular functions cannot be excluded. The effect of Ca2+ depletion on the mitochondria themselves is of critical importance leading to disruption of the mitochondrial inner membrane potential and to necrosis of the Mφ (40). Our findings support the hypothesis of Kroemer et al. (41) that the relative quantity of apoptogenic factors released vs the extent of mitochondrial dysfunction is responsible for induction of either apoptosis or necrosis. In intact mitochondria, the transmembrane potential (ΔΨm) keeps the inner portion of the inner mitochondrial membrane negatively charged, which allows accumulation of the cationic dye DiOC6(3) in the mitochondrial matrix. Reduction of DiOC6(3) retention within the mitochondria is an indicator for loss of ΔΨm, which is the consequence of MPT. Necrosis of Mtb-infected Mφ in presence of RR correlates with reduced DiOC6(3) retention within the mitochondria and indicates the collapse of ΔΨm. High [Ca2+]i induced by A23187 rescues mitochondria from irreversible damage which manifests itself in an increase of DiOC6(3) retention within the mitochondria and Mφ apoptosis. In agreement with this model, HepG2 cells exposed to proapoptotic stimuli seem to undergo reversible mitochondrial membrane pore opening. Reversible mitochondrial pore opening was postulated on the basis of a transient increase in [Ca2+]i that caused a pulse of cytochrome c release from the mitochondria and apoptosis. Apoptosis was thought to be dependent on resealing of the pores and prompt recovery of the mitochondrial energy metabolism. Despite ongoing caspase activation, the mitochondrial metabolism required for apoptosis was found to be intact (17, 22). We hypothesize that a similar mechanism is effective in Mtb-infected Mφ in which A23187 induces a transient increase of [Ca2+]i. The ensuing increase of [Ca2+]m (23) is thought to be due to the presence of a passive uniporter in the mitochondrial membrane, a structure that increases ion diffusion down the electrochemical gradient and does not couple the transport to that of any other ion (42). In presence of A23187, no reduction of DiOC6(3) retention in the mitochondria was observed, suggesting that in presence of high [Ca2+]m, mitochondrial pore opening is reversible and does not lead to permanent breakdown of ΔΨm, resulting in apoptosis rather than in necrosis. Although in infected Mφ, A23187 down-regulates cytochrome c release, caspase activation and apoptosis were clearly detectable. We speculate that our method used to detect cytochrome c release from the mitochondria, Western blotting, is not sensitive enough to measure the small amounts of cytochrome c released in the presence of A23187 that are nevertheless sufficient for activation of procaspase-9 and for triggering of the apoptotic cascade. Alternatively, unrelated mechanisms may lead to caspase-9 activation (43, 44). The suggested transient nature of mitochondrial pore opening further implies that release of cytochrome c into the cytosol does not require collapse of ΔΨm, an event that leads to irreversible MPT pore opening (45, 46, 47) combined with wholesale release of apoptogenic mediators (48). Several studies indicating that cytochrome c is released from mitochondria early in the onset of apoptosis in the absence of MPT are in line with our studies (49, 50, 51, 52) and suggest that irreversible MPT is not required for cytochrome c release. Therefore, we propose that a delicate balance between signals is required in infected Mφ to induce apoptosis and Mtb elimination, because on one hand sufficient amounts of apoptogenic factors need to be released from the mitochondria, but in contrast mitochondria need to remain intact to prevent necrosis. Our studies strongly indicate a key role for calcium in the outcome of the type of cell death. Published evidence indicates that inhibition of Ca2+ transport into the mitochondria by RR leads to irreversible decrease of [Ca2+]m (28). We could document loss of ΔΨm, mitochondrial swelling, enhanced necrosis, and bacterial growth in Mφ incubated with Mtb and RR as a possible consequence of [Ca2+]m breakdown. Surprisingly, both drugs, A23187 and RR, have no or only a slight effect on the survival of uninfected Mφ, indicating that signals emanating from the mycobacteria are the primary inducers of cell death. Cumulatively, these findings lead to the conclusion that high [Ca2+]i required for effective maintenance of mitochondrial functions after infection of the Mφ with Mtb is of critical importance for the defense against Mtb. Therefore, we hypothesize that drugs which increase [Ca2+]i and aid in the protection of mitochondrial integrity might be suitable therapeutic tools to bolster innate immune defense mechanisms against Mtb. We thank Patrick Yacono (Harvard Medical School, Boston, MA) for the help in performing the calcium measurements. ↵1 This study was supported by National Institutes of Health Grants AI50216 and HL64884. ↵2 L.D. and H.G. contributed equally to this work. ↵4 Abbreviations used in this paper: Mtb, M. tuberculosis; Mφ, macrophage; MPT, mitochondrial permeability transition; ΔΨm, mitochondrial membrane potential; RR, ruthenium red; DiOC6(3), 3,3′-dihexyloxycarbocyanine iodide; CHX, cycloheximide; PARP, poly(ADP-ribose) polymerase; [Ca2+]i, cytosolic Ca2+ concentration; [Ca2+]m, intramitochondrial Ca2+ concentration; PI, propidium iodide. Dannenberg, A., G. A. W. Rook. 1994. Pathogenesis of pulmonary tuberculosis: an interplay of tissue-damaging and macrophage-activating immune responses—dual mechanisms that control bacillary multiplication. B. Bloom, ed. Tuberculosis: Pathogenesis, Protection, and Control 459 Am. Soc. Microbiol, Washington, DC.